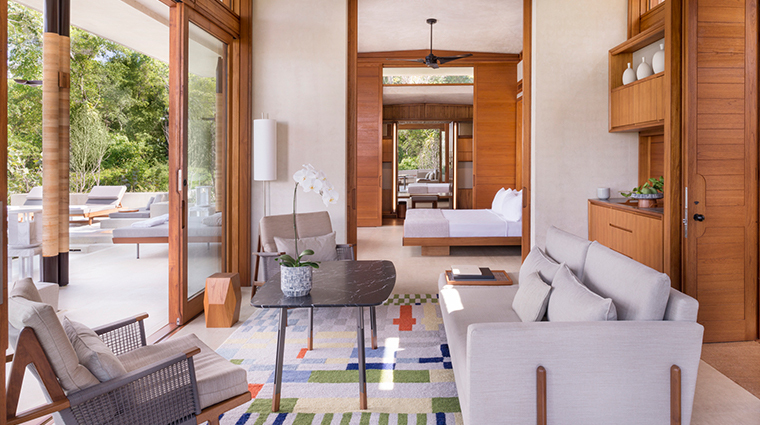 Revered Asian luxury boutique operator Aman never did a golf resort before opening Amanera on the North Shore of the Dominican Republic in late 2015, but the first time was the charm. The golf course, a rebuild of a classic Robert Trent Jones design by his esteemed architect son Rees Jones, has more coastal exposure than any other in the Western Hemisphere, and is arguably the best in the Caribbean. But the real magic of this luxury beach resort is that many guests don’t even play golf and still love the place. The 2,000-acre property has a huge, gorgeous, private beach, private mountain with hiking and mountain biking trails, and much more, all for just 25 decadent casitas. Evoking Bali, these are large, beautifully designed and crafted, and full of creature comforts like private pools and outdoor showers. Designed by London-based Heah & Co., main building Casa Grande is an architectural gem of curvaceous poured concrete in the shape of a wave, perched on a cliff at the edge of the sea. 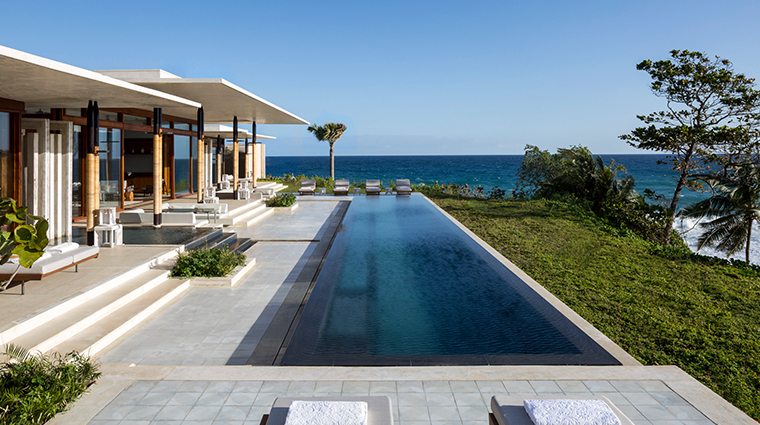 Aman’s Dominican outpost delivers beauty, privacy and wonder at every turn, on and off the golf course, complemented by a friendly and well-trained staff. Known as the “Pebble Beach of the Caribbean,” the golf course is a world-class jaw dropper, with an unprecedented 10 coastal holes, including an unforgettable five-hole cliff-top finale. 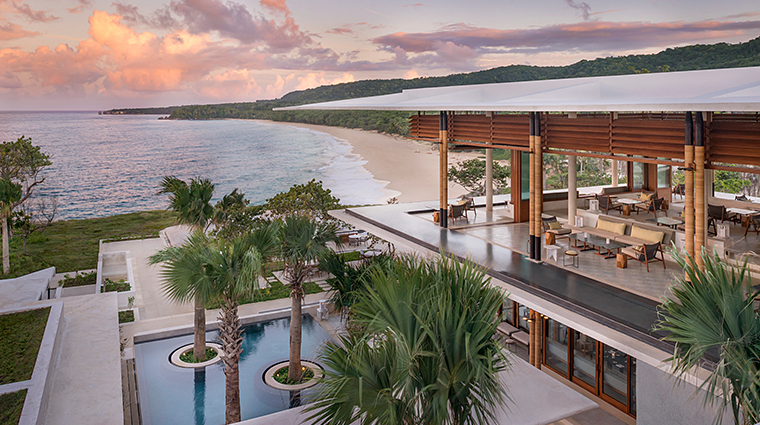 Amanera owns its own mountain across the road form the main resort, with guided hikes to an open-air thatched lean-to, where a lavish picnic lunch is served with sweeping vistas of the azure Caribbean. Emptiness is the true luxury at this enormous Dominican Republic hotel, intentionally employed throughout the property so you feel like you have run of the place. All restaurants and bars, the lobby infinity pool, and the beach are excessively oversized — any could accommodate all guests at once and still feel uncrowded. 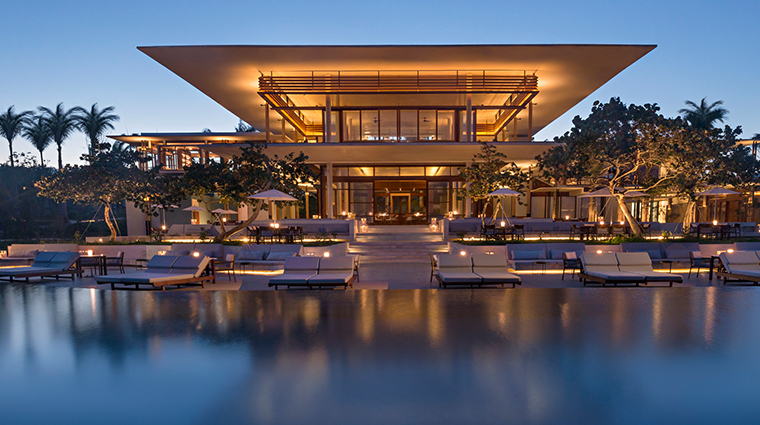 Activities abound, and Amanera employs its own guides for hiking and mountain biking, while trainers have group and private yoga and Pilates classes. Offsite excursions range from deep-sea fishing and kite surfing to rum distillery tours. The resort has its own boat on a famed mangrove lagoon for eco/snorkeling tours. Hotel rates include private transfers in luxury autos, plus an airport meet-and-greet VIP experience where arriving guests are led to a private lounge for drinks while their baggage is retrieved and loaded, then whisked through immigration. The original plan was to limit the ultra-exclusive golf course to resort guests and the handful of local homeowner members, but it has since opened to outside play, which may make it more crowded. Almost all of the villas have private pools but a handful do not, and while some are steps from the main Casa Grande building and restaurants, others are too far away for many guests to walk, necessitating frequent calls for a golf cart ride. All lodging is in individual freestanding villas, 25 of them. 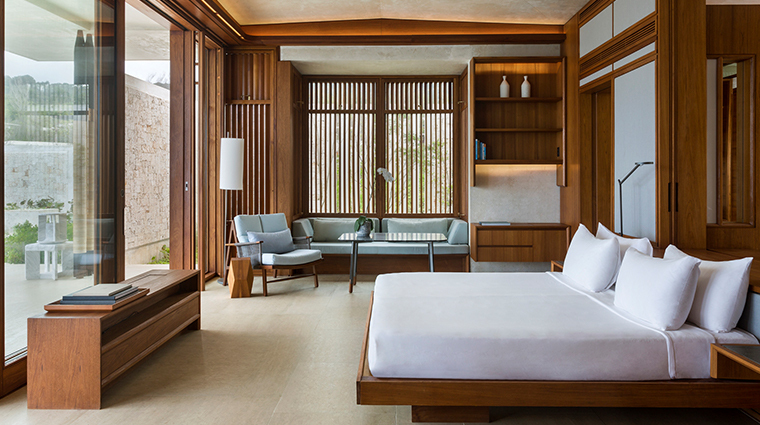 The villas have Balinese architectural influence and generous indoor and outdoor living areas. Vastness is used to accentuate the luxury feel in the villas, which are broken up into multiple indoor and outdoor spaces. Even the smallest one-bedroom casita has two separate outdoor dining areas that could seat 20 and an actual pool, not a plunge style. Like a ship’s interior, the furnishings are sleek and feature many built-ins, hiding the espresso maker and such from view, while still offering every imaginable amenity, including massive amounts of closet space — and even an interior garden. The Restaurant is the main three-meal-a-day option, with inside and outside seating at Casa Grande. It features organic produce, fresh seafood and modern takes on Dominican traditions, with a Mexican spin. Club de Playa sits down by the resort’s private beach, providing lunch and beachside service during the day, then torch-lit dinners on the sand or the open-air structure. It has a heavy emphasis on freshly caught local seafood and ceviche, and even offers ceviche cooking classes. Beyond the private beach is popular local park with serval open-air traditional Dominican “beach shack” bar/restaurants. To provide an authentically colorful local experience without worry, the luxury hotel has befriended and vetted the best purveyors and can reserve seats for friendly but VIP treatment. The bar at Casa Grande specializes in a deep list of Caribbean rums, rum cocktails and has weekly cigar rolling demonstrations by a master craftsman with tastings — Amanera is the first Aman resort with its own private-label cigar brand, custom made exclusively for the bar and adjacent cigar shop.